Acorn Engineering Group were announced as winners of the Business of the Year award at the 2017 Thames Valley Business & Community Awards. 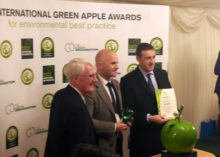 Acorn Engineering Group were proud to be presented with the Green Champion Winner of the Services Industry Carbon Reduction category. The award was received for their Carbon Reduction project which is to reduce Carbon Reduction annually by at least 5%. Acorn Engineering Group were announced SME Business of the year award, demonstrating excelling in people management, sales and marketing, operational quality and financial performance. Acorn Maintenance Engineering were announced as winners of the Employer of the Year award, demonstrating being a good employer, developing our people and helping them deliver personal and business objectives. AIS BMS in partnership with NG Bailey were the winner in the Partners in Sustainability category in this year's PFM awards for their Dashwood House - a ground breaking energy reduction pilot submission.